Couples who want to share more than vows are getting the opportunity to share their bone too in a "bio jewellery" research project. Using bioglass, a special bioactive ceramic which mimics the structure of bone material, researchers are growing rings made out of the couples' bone. Five couples are having the rings made. 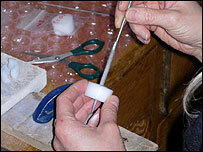 They will be grown from bone cells taken from their jawbone. The project in London aims to ignite public debate about bioengineering. "By talking about science breakthroughs as designers, we can make objects and engage the public, their imagination and their desires and so on," Tobie Kerridge, co-researcher on the project, explained to the BBC News website. The Biojewellery project, a joint effort between designers Mr Kerridge and Nikki Stott from the Royal College of Art in London, and Dr Ian Thompson, a bioengineer from Kings College London, lasts initially for 10 months. "We are interested in how technological innovation is used by human needs and desire rather than the pure functionality of the innovation," explained Mr Kerridge. Each couple, selected from 180 volunteers across the UK, will have their wisdom teeth extracted at Guy's Hospital in London. The eventual product will be a specially designed pair of rings made from a combination of traditional precious metals and the bone tissue of either partner. Often there are bits of bone left in the gap where a wisdom tooth attached itself to the jawbone. These segments are rich in osteoblasts - the cells which are responsible for forming bones. "Basically, the material is a baked glass ceramic composite. It goes through a couple of processes and ends up as porous bioactive material which mimics the structure of bone," said Mr Kerridge. "We seed it with osteoblast, which are the bone cells. They grow into the structure and the material then becomes replaced with bone material." The original plan was to attempt to take a biopsy from the volunteers, but the ethics and the risks of undergoing such a medical procedure were too great. Eventually the technique, which is an emerging one, could be used to grow large bits of bone for people with cancer or who need bone replacements. Several research teams around the world are experimenting with different methods to grow bone. Scientists have transformed stem cells from adult human bone marrow into nerve cells by transplanting them into damaged chicken embryos. Another group of researchers are developing an inkjet printer that can create "made to measure" skin and bones to treat people with severe burns or disfigurements. But bone growing research is still at early stages, and bone which can sustain and survive with its own blood vessel structures, for instance, is some way off. 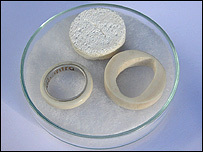 Early prototypes of the bone jewellery have been made using cow bone marrow. But, say the researchers, the process is very fragile. It takes about six to 10 weeks to complete the growth process. The growing process is being filmed with time-lapse photography and the actual making of the rings in the studio is to be recorded as part of the project. Design experts and bioengineers are not necessarily thought of as familiar research partners. "We started off thinking there is a dislocation between how people imagine breakthroughs in technology, and the research itself," explained Mr Kerridge. "There is no way for us to engage in this medical process yet, even though it will be affecting us in the future. So we thought about giving it a framework around things people know." The researchers first considered creating bone-made mobile phone covers, but settled instead on rings. Rings have long been considered to be evocative social symbols for cultures around the globe. People give certain rings meaning when they see them; on the "wedding finger", or on the finger of religious figures, for instance. They also publicly represent, in discreet ways, who people are. The researchers thought they would be the ideal objects with which to experiment. "It humanises this process and lets people key into it. Through that, they can relate to it," said Mr Kerridge. It gives the researchers a hook with which to stimulate public thinking, imagination and debate about the ethics of such scientific techniques. "One couple, Trish and Lyn, are really excited to have this expression of their relationship. "Others are really interested in the materials science side. Others are from the piercing world and are interested in using bone in piercings." The project will wrap up with an exhibition at Guy's Hospital, as well as a public debate at the Dana Centre, part of London's Science Museum.